Look at the chart above and you'll see two things happening. 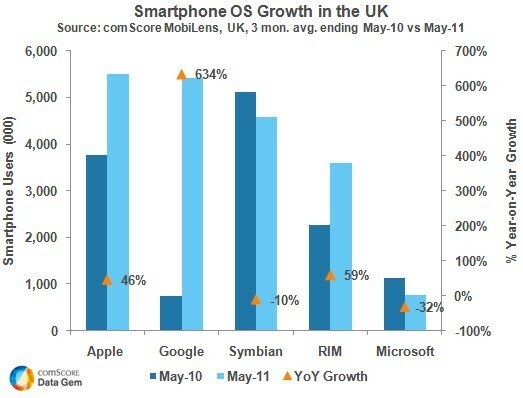 First, Apple has overtaken Symbian to become the top smartphone platform in the UK (with a 27 percent market share). And secondly, Android has grown 634 percent year-over-year to shoot into second place, with less than half a percentage point keeping it from the top spot (other reports already place it ahead). As you might expect, much of that growth isn't coming from folks switching from one smartphone to the other, but from new smartphone users -- Comscore found that 42 percent of all mobile users in the UK used a smartphone in May of this year, compared to just 27 percent a year ago. Of course, that also means that 58 percent of UK cellphone users are still potential smartphone users (to say nothing of those that still don't have a cellphone at all), so there's certainly still plenty up for grabs for all involved. helpful and it has helped me out loads. I'm hoping to give a contribution & aid different customers like its helped me. Good job. thank you for your time for this particularly wonderful read! This paragraph is in fact a pleasant one it assists new web people, who are wishing in favor of blogging. Hi to every body, it's my first pay a visit of this blog; this website contains awesome and in fact excellent data in favor of visitors. ӏt's beautifully made, showing off the nouveau visual appeal having moving projection screens, attractive persons, knowning that current experience you are able to just reach a real-world Casino. Quite a few brand new High Roller Casino players produce gambling blunders which expense these people lots of money and acquire them outside of tourneys.